I know, I know! The lure this afternoon was just too great. A bit of blog surfing (which I originally alloted myself half-an-hour) has resulted in a whole nap time session and this post. Ack! Fortunately, I actually had a few crafty things to write about. I had been stalking this pattern on Etsy for a few months, before I finally took the plunge a fortnight ago. And my goodness! It's the most ladylike scarf I've ever seen....or made. This is my practice version in Sublime worsted weight blend of cashmere, merino and silk. I made it longer than the pattern wanted, cos I like it nice and dangly. This one's in vintage red, which I'll be keeping. But for my mum's Mother's Day package I hooked it up in the mulberry. The true colour is more like a dusky pink. So pretty! And yes, she loves it! In fact it matches her outfit perfectly when we picked her up for a lunch outing today. One more thingy, I promised you peeps a photo of the wee one sporting that patchwork smock I made two months ago. I decked her out in it for a party last weekend. Here's the cutie posing with the mostly-eaten bribe. Yes, I do that, too. Too all you mums and grandmums....hope you're having a nice Mother's Day! The scarf is really beautiful Jade! Love the red version you made and the patchwork smock (and the kiddo!)! Take your time, hope you‘re doing fine! I must admit I love my blogus breakus! Gorgeous scarf Jade - very pretty. The smock is just divine and so inspiring - I really should whip one up for my little Daphne. Hope you're having a really lovely Mother's Day. The pinafore looks so lovely. Very cute on. I am so jealous of your crocheting. Stunning. Wow - that scarf is truly amazing! 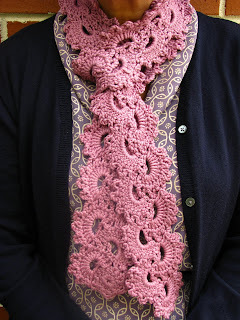 I love it - I really wish I knew how to crochet!! I can see why you are keeping the red version!! Enjoy your bloggus breakus! See you when you return! Both the scarves are beautiful: they look delicate and squooshy!!! glad you were able to interrupt your blogus breakus! I miss you! Both of the scarves are beautiful Jade, that's one gorgeous pattern. I love the patchwork smock too, it's really sweet and the colours are scrummy. beautiful scarves and how cute does little camille look...I loved that little dress! she's such a cutie and I just remember her little legs running around the park picking up food as she goes....I still giggle when I think of it! Oh I love that scarf, it looks absolutely stunning. Red is a great color and the sublime yarn would be extremely soft too. Your mum's looks just as gorgeous in pink. 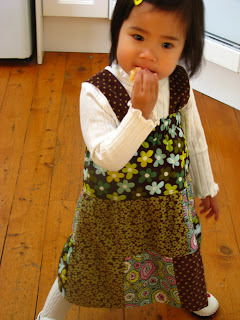 Your daughter's patchwork smock dress is so cute. Bribes nearly always work here too. Oooh, pretty pretties Jade! They're beautiful. And look at the little Bub -- she looks adorable in her new smock -- too, too cute! you've been a very busy girl.. I love your blog and I love your creations, you are GREAT! Just have to wait till my sewing table is moved to the new house! That is a gorgeous scarf! And the clothes you are making for your little girl are just so cute. I'm off to browse your archives - thank you for so much inspiration!